Do My Gutters Need Replacing? Maintaining gutters on your home can sometimes create hassles, particularly if they have generated holes. Having holes in your gutters stops the flow of water away from your home. In addition, it can cause your home to appear dilapidated, crippling your curb appeal. Disintegrated gutters can also wreak havoc on your home’s fascia boards by creating the perfect environment for rot to commence. A rotten fascia board can lead to water leaking inside your siding, running through your walls and eventually down to your infrastructure. A critical component of a home’s health is gutters in good working order. Below are warning signs your gutters need replacement. Seeing nails and screws on the ground? This could be an indicator that your gutters aren’t properly secured to your home. Gutters that aren’t correctly fastened soon sag and provide an open space for water to get behind your fascia board and into your home’s walls. 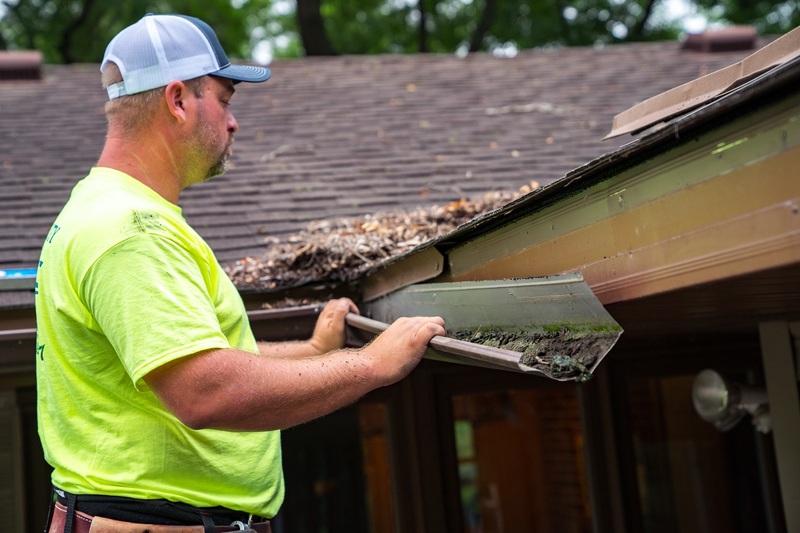 Dipping gutters can be the result of improper install, clogging, or even warping over time due to weather and the settling of the foundation. In order to avoid these issues, continued review is needed. Are pools of water or dirt appearing inside your gutters or next to your home? Left unaddressed, the buildup of water will leak into your basement, splash dirt onto your siding, and drip on your guests’ heads as they enter and exit your home. Maintaining your gutters is a bothersome task, however, it helps prolong the lifespan of your home and your personal euphoria of knowing your home is well taken care of. Let’s talk about all those hours you’ve put into your lawn. You’ve seeded, you’ve mowed, you’ve aerated. Without proper functioning gutters, you can say goodbye to a vibrant and lawn which can quickly become eroded by failing gutters. You can avoid drowning your grass and plants with well-placed and preserved gutters. Have you noticed the crack in the driveway following you as you walk to grab your mail? Clumsily installed gutters misguide the water, allowing it to stream down the driveway eroding the pavement. The structural integrity of your driveway effects your home from the foundation all the way up to the roof. How Much Do You Love Mosquitoes? Safe to say mosquitoes are one of the most long-established nuisances of northern life. 10,000 lakes is more than enough of a feeding ground for the little buggers, however they still find a way to be as close to us as possible. Mistakenly sloped gutters create pools of water which is the best feeding ground for mosquitoes and other pests. Avoid having unwanted guests by making sure your gutters are installed with an appropriate slant to avoid small puddles from gathering. What Can I Do to Prevent These Issues? LeafGuard® Brand Gutters installed by our team can save you hours of work and bottles of aspirin. LeafGuard® Brand Gutters are not only seamless, but come with the top already attached to the gutter providing the ultimate protection against debris. Hardworking LeafGuard® installers are specifically trained to ensure the greatest quality gutters. Leaving you unrestricted to clean your gutters as they are maintenance free and guaranteed not to clog, or we’ll clean them for you! LeafGuard® Gutters come in 14 different colors to accommodate the call for curb appeal. They also come with the Good Housekeeping Seal of approval and can handle over 32 inches of rain in an hour because of the oversized design. When you find yourself nettled, it’s time to make the correction. The gutters on this 1950's era Hennepin County home were clogging on a routine basis. Learn how the installation of LeafGuard® Brand Gutters was able to correct the situation. The Lindus Construction crew showed up on time and completed the job the same day. They did a great job of installing the LeafGuard® gutters and I would highly recommend them to anyone considering installing LeafGuard®! - Jeff J. "We were pleased with the overall service. Highly professional. I would recommend to possible future customers that the product and workmanship are quite good." - Bill V.
"LeafGuard® rain gutters are the best! They help to keep water from running into my basement." - Jean B. "I was very happy with the work that was done - tearing off the old gutters and downspouts and replacing with new LeafGuard® gutters and downspouts. They were very neat, efficient, quiet and professional with their work. I would recommend your company in a heartbeat." - Elgene J. "They are the best in my book." - Buddy D.
"When work was done, it was fast and efficient. Second house I've had LeafGuard® installed. Great product." - Bill C.